Recruiting more male teachers will not help close the gap between boys' and girls' educational achievement, government researchers say. Ministers plan to increase the number of men in the classroom as part of plans to help boys get better grades. But a report released by the Department for Children, Schools and Families suggested the approach was "simplistic" and could back-fire. Using more boy-friendly teaching styles was also unlikely to help, it added. The report - Gender and Education: The Evidence on Pupils in England - was a review of previous research into the fact that girls consistently out-perform boys at GCSE, especially in subjects like English. 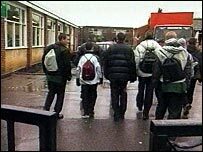 Do primary schools let boys down? And results last summer showed that by the age of 14 boys were 14% behind girls on average in their national test results for English. The DCSF report said: "The increasing gender imbalance in the school workforce has raised concern that male role models are not available to boys. "The fact that policy efforts have been made to address this imbalance reflects the theory that having more male teachers could help to raise the attainment (and/or improve the behaviour) of boys. "However, this approach has been criticised as simplistic." This was because research carried out last year found that two-thirds of pupils rejected the idea that the gender of their teachers mattered. Instead children looked at the qualities of teachers, rather than their gender. Both boys and girls said they thought teachers treated boys more harshly than girls. The report said: "This finding is in line with other research suggesting that teachers have low expectations of boys' academic potential and such low expectations could contribute to their low achievement." Some experts have suggested that boys perform less well than girls in schools because women teachers, who make up 84% of primary school teachers and 54% of secondary school teachers, naturally taught in ways preferred by girls. But the report found little evidence that boys and girls had different learning styles. It also said that there was no case for introducing boy-friendly teaching methods because anything that was likely to improve boys' grades would also improve girls' results. This would then perpetuate the gender gap, the report argued. A DCSF spokesperson said: "It would be difficult to deny that positive role models are important to young people even if this cannot be proven in research. "Boys do underachieve compared to girls in most subjects and this is a problem in almost every country in the developed world. "However, we are working hard to close the gap and we are already seeing some small improvements."